We have two fun filled weeks of #hiloskyeveryday2014 to catch up on! That is a lot of pictures!!! Day 129 - Blakely loving one of the rides at Sesame Place! Last summer, she was too small to go on most of the rides, but she is loving it this year! Day 130 - Happy Saturday! Daddy was working a ton of overtime during the week, so we were all super excited to have him home! Day 131 - Mother's Day 2014! This was my gift from John and the Girls! 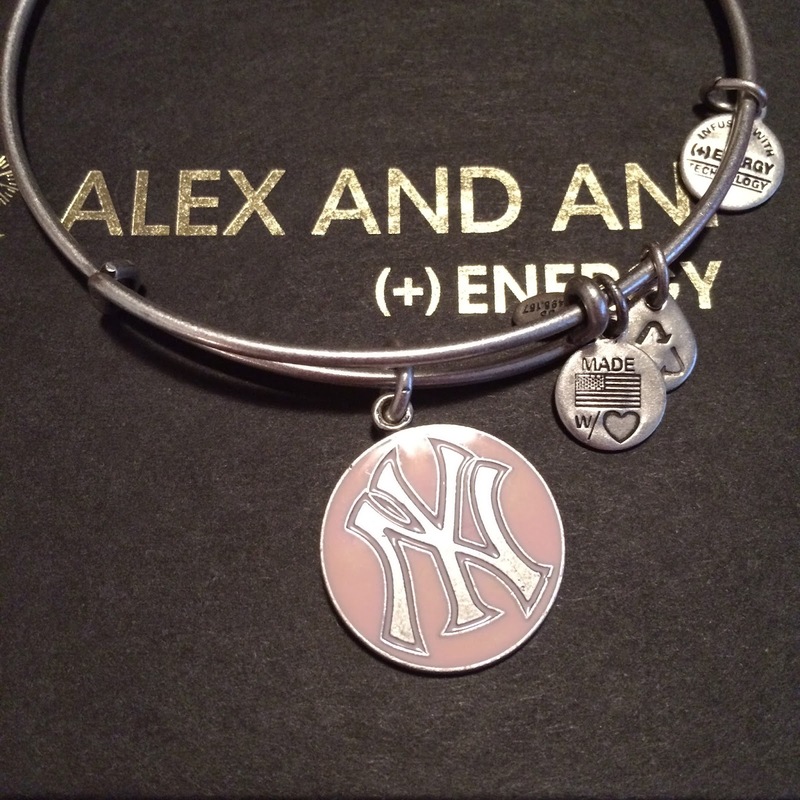 You can read about my love for the Yankees in this post! And of course, the fact that it is pink just makes it perfect! 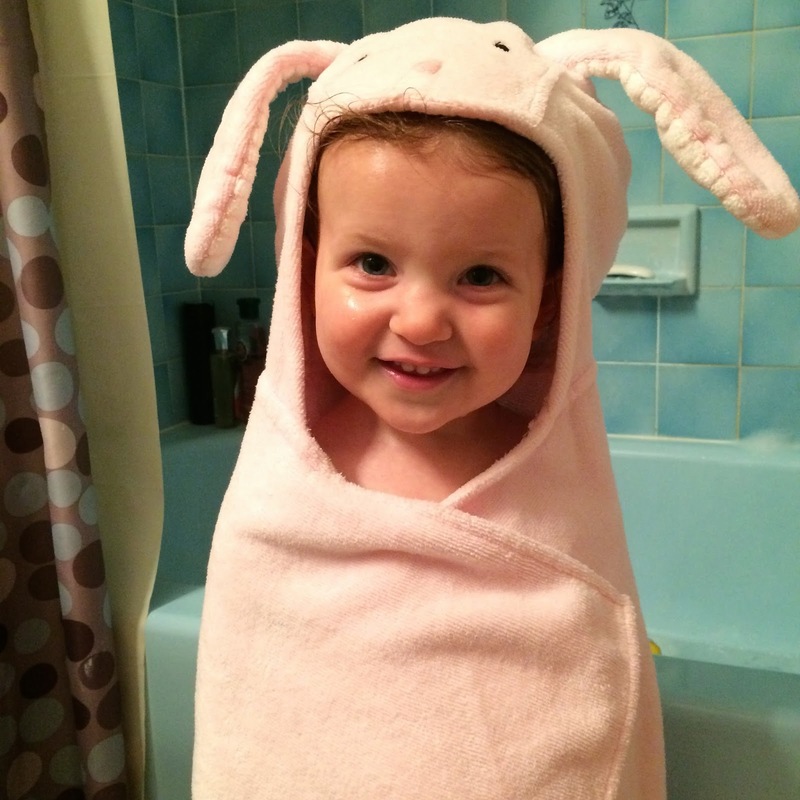 Day 132 - This sweet little snuggle bunny just melts my heart! Day 133 - Whenever we head out for a walk, my girls always hold hands. It is a sight that truly makes my heart explode with love and happiness! When I found out that Blakely was a girl, I was so excited. This was exactly what I pictured - sisters and best friends! Day 134 - True story...out of all the toys we own this is my children's favorite game...being pulled by someone with a jumprope. Yup, just like walking a dog. 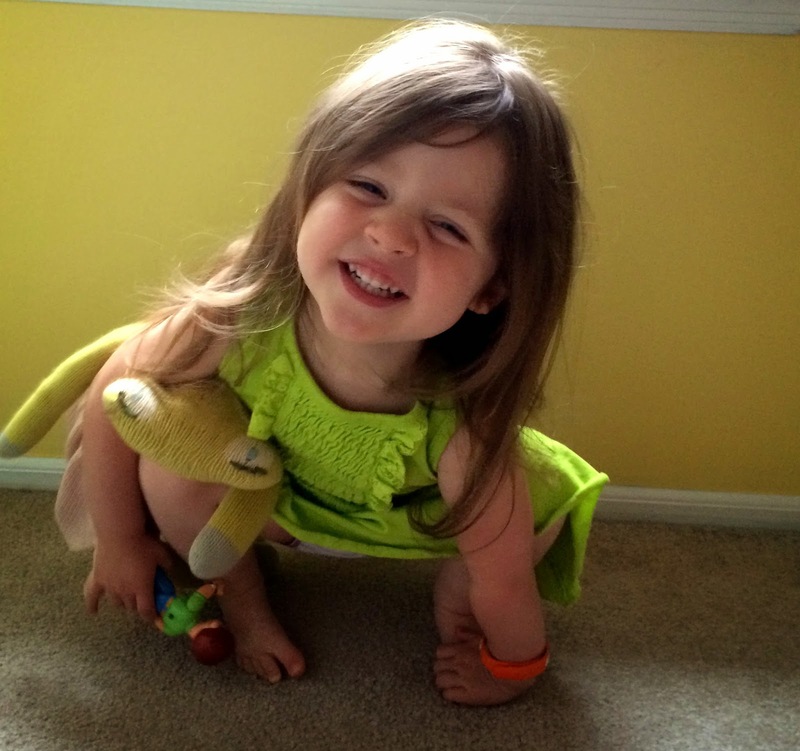 Day 135 - This little cutie pie turned 1 1/2!!! We, of course, celebrate half birthdays in the Hilosky House! It's such a fun little family tradition! You can read more about Blakely's half birthday celebration in this post! Day 136 - all of the sudden, Lacie wants her picture taken all the time! She will randomly say "Mommy Cheese" or "Mommy take Lacie and Blakely's picture." Day 137 - At the car wash! Day 138 - This girl loves brushing her teeth! With a mermaid toothbrush of course! Day 139 - Oh Blakely! I really think she knows how cute she looks in her sunglasses! Day 140 - So excited for some summer weather! We headed over to Nana and Pop-Pops to go in the "pool" which of course means play with the water table! Our pool won't be open until this weekend...but I have a feeling it is going to be very very cold. Day 141 - *sigh* Sweet B had her 18 month old well visit with the pediatrician. Of course that meant she got a shot. There was a ton of drama and tears. 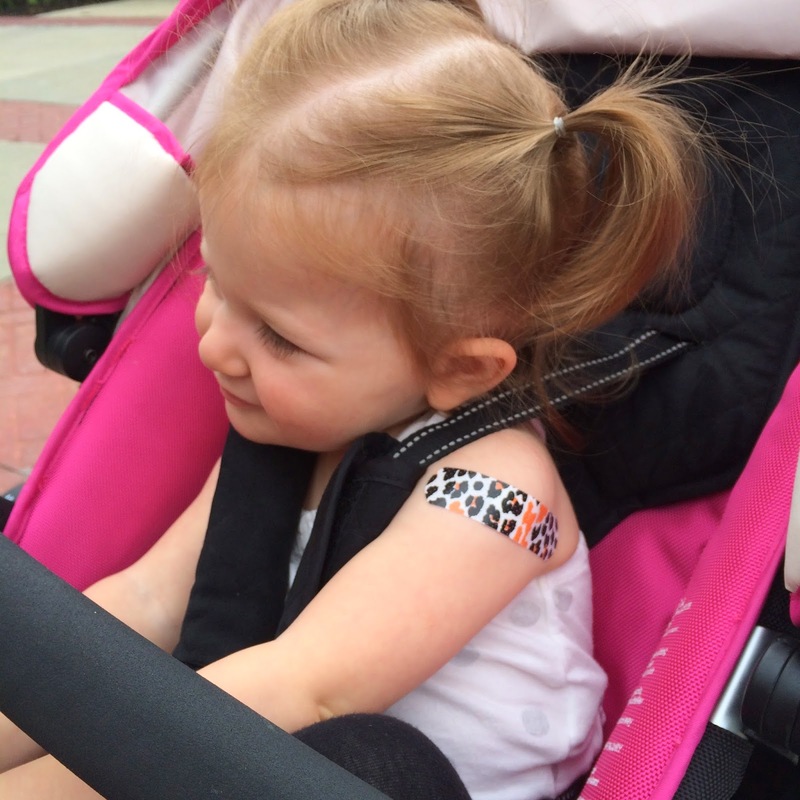 She has the battle wound and sweet little bandaid to prove it. Day 142 - Lacie Jane's first haircut since she was 11 months old...so this will be the first one she remembers! She was a bit nervous at first, but then soon realized that she was a princess! 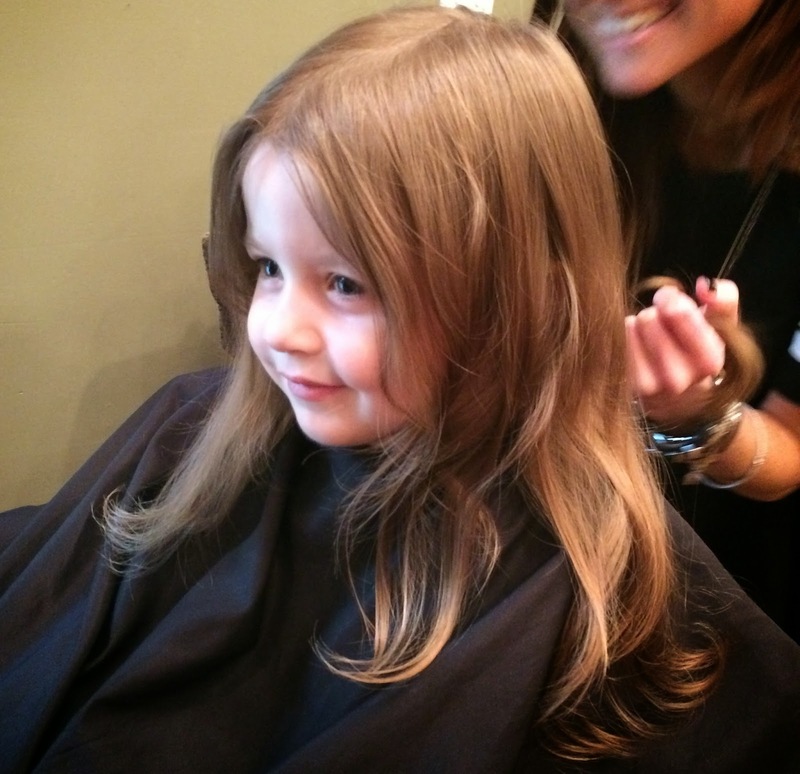 And of course everyone at the salon loved her! She even got sparkles in her hair at the end!